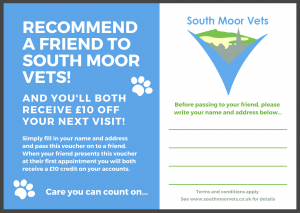 Recommend a Friend to South Moor Vets! AND YOU’LL BOTH RECEIVE £10 OFF YOUR NEXT VISIT! Simply request one of our Recommend a Friend Vouchers from the reception of any of our branches and fill in your name and address before passing to a friend. When your friend presents this voucher at their first appointment you will both receive a £10 credit on your accounts. Terms and Conditions apply. Please click here to read them.